Transit options for Columbia Pike are not promising. ART bus faces increasing demand and numbers of buses but without the infrastructure support. In 2014, the Columbia Pike Streetcar was killed, citing public backlash against the costs and logistics. At the time, the County Board promised that an alternative solution would be found to ease the connectivity problems along south Arlington’s main street. But three years later, Arlington County seems no closer to a solution. 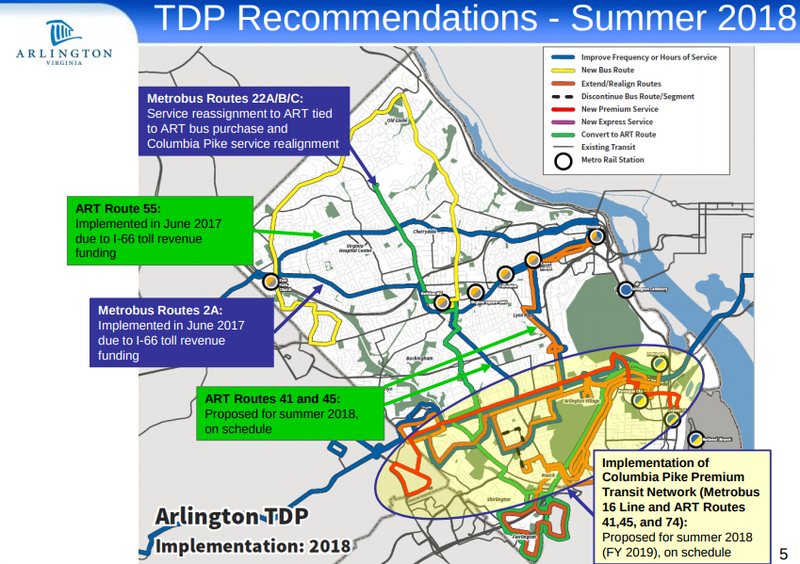 At a June 27 work session, the County Board set high expectations for Columbia Pike transit that county staff worked to bring back to ground level. The Transportation Development Plan, approved last year, lists the goals along Columbia Pike as increasing capacity to meet the 10-year demand, investing into transit that supports economic development. One major part of the goals involves connecting Columbia Pike with other key areas and other transportation networks around the region, like the Metro. This was one of the primary goals of the streetcar. Finally, the plan calls for a fast, frequent, reliable and easy-to-use premium transit service. But as the plans are coming together for transit solutions, it’s becoming clear that each solution comes with its own share of problems. Much of the discussion was torn between the County Board’s ambitions of transit along Columbia Pike and staff attempting to temper those ambitions with a realistic view of the street’s limitations. County Board members expressed an interest in a transitway, mirroring the kind that runs through Alexandria up into Crystal City. But Transportation Director Dennis Leach noted that the layout of the streets along Columbia Pike makes transit lanes difficult to implement and could even risk making traffic along Columbia Pike worse. In the staff presentation, it was noted that current ART bus facilities are inadequate to support the increased busload proposed under the transportation plan. ART buses are already expected to exceed storage capacity by 2020, and in 2023 the county will face a dramatic loss in storage capacities when the lease for the Shirlington Road facility expires. Staff pointed to the relatively low bus utilization along Columbia Pike as an indicator that increased public transit options might not justify the cost. But County Board member Katie Cristol said that the objective is not to meet current demand but to offer transit options that would draw people away from cars and towards mass transit. For other members of the County Board, offering transit is an obligation after the promise made to the region in the wake of the streetcar plans being cancelled. But despite the County Board’s ambitions, county staff repeatedly emphasized that there are very real-world challenges facing transit expansion along Columbia Pike, not the least of which is heavy cost. Arlington Streetcar: Desire or Disaster?